Do you own a business that needs great marketing efforts? Are you not sure which ones to implement? Some businesses have a marketing team within the company, some hire a digital marketing or advertising agencies to help them out. 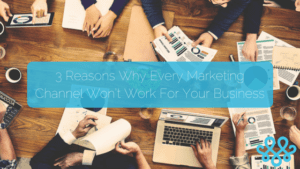 If we can answer one question that you might have, the answer is that every marketing channel is not necessarily going to work for your business. It depends what type of business you have, how big or small your audience is, who your target market is, what content they want to see and what channels they want to see it on. Online advertising requires constant monitoring and optimizing. Larger brands or companies have the budget so they most likely hire a digital agency to do their marketing work. This allows time and strictly marketing efforts to go into their work. This is most likely why they are on almost every channel. However, smaller companies with limited staff doing their own marketing or advertising usually don’t have the time to manage and optimize several different channels. These candidates need to choose one to two options to advertise on. Different business types have different audiences, and their intent is not always the same either. For instance, if you’re customers are 40-60 years old, you probably don’t want to use SnapChat as a major marketing channel – you won’t reach them there. To know who your audience is and what their intent is you need to conduct “stakeholder interviews,” – this is an extremely effective way of getting to know more about your audience. COST-PER-ACQUISITION CAN VARY DRAMATICALLY BETWEEN CHANNELS. There is no need to jump in all at once. Be strategic about how you start marketing through the channels that you use. You also have to pay very close attention to your data and constantly optimize. Pick a channel to focus on, build out your program, then move to the next. You’ll also see that once you have one channel built, you can use that to build more. For instance, if you have a large email list, you can use that to promote your Facebook page. Just as important, you need to know when it’s time to abandon one channel and focus on more promising marketing opportunities.